SOCCER - TALISMAN Felix ‘Fela’ Badenhorst scored a scorcher as Mbabane Swallows took control of CAF Champions League Group D with a 1-0 win over Primeiro de Agosto of Angola at Mavuso Sports Centre yesterday. Swallows came into the match having collected a point away to Zambian champions Zesco United in their first Champions League group stage match over a week ago. Swallows began well, controlling proceedings on a bumpy Mavuso pitch. Captain Tony ‘TT’ Tsabedze tried a looped effort in the 5th minute but it went over the crossbar. The ‘Birds’ continued dominating and Badenhorst tried a shot from range in the 21st minute but it went wide of the bar. Agosto were proving a tough nut to crack but Swallows continued probing. In the 28th minute, ‘TT’ whipped in a teasing ball from a free-kick but none of his teammates met it. 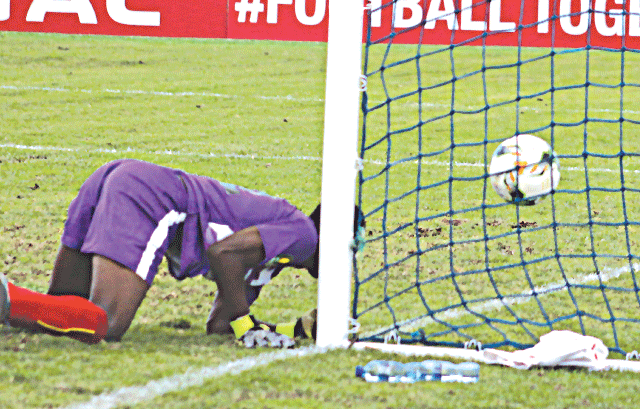 It was the same again in the 37th minute as another veteran, Wonder ‘Samba Jive’ Nhleko, failed to connect with a well weighted Badenhorst cross. Swallows were almost made to pay for their wastefulness in the 42nd minute but were saved by goalkeeper Sandile ‘Nkomishi’ Ginindza, who parried away a goal bound header from Agosto’s Jose Ganga. The match went into the halftime break goalless. Agosto almost took the lead a minute into the restart as Bakulu Bitumba went agonisingly close to meeting a cross from Paulo Bartolomeu. Swallows then seized total control of the match from there on as Agosto retreated. In the 58th minute, Tsabedze inspired a nice build-up before firing a shot which Agosto goalkeeper Adilson Cipriano parried away. There would be no stopping Swallows two minutes later. The dominant Njabulo ‘D4D’ Ndlovu began the move, powering a long ball towards Nhleko, who controlled it in the opposition box, held up his marker before teeing up an on rushing Badenhorst. The Swallows number 7 made a brilliant connection with the ball, hitting it with control and precision. The ball deflected slightly on an Agosto defender before beating the goalkeeper and settling in the net. Mavuso erupted in celebration as Badenhorst celebrated his fourth Champions League goal of the campaign. Swallows were in total control after that with Sikhondze and Ndlovu bossing the midfield. However, Agosto almost found their equaliser seven minutes from time but Ginindza pulled off an unbelievable one hand save to deny Agosto’s Regio Zalata from point blank range. Swallows had survived and held on for the remaining minutes to record their first win of the group stage and their fourth in six Champions League games this season.